"Toxic Workplace! describes how to identify and best work with toxic personalities. It also provides a systemic approach for creating a culture that's positive and respectful while improving the bottom line. Kusy and Holloway share how their national research translates into real-world practices in organizations. I endorse their practical, concrete approaches that will make a significant difference in organizations today and in the future." "Toxic Workplace! brings a rare and valuable view of one of the great challenges facing leaders in today's organizations. 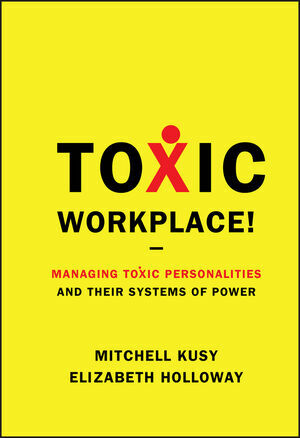 It is a significant guidebook to the healthy enterprise of the future, not only because of Kusy and Holloway's systems approach to dealing with toxic personalities, but also their unique practice of creating communities of respectful engagement. This book demonstrates how this impacts both organizational social responsibility and the bottom line." "Transforming the culture to support the strategy and mission is the real stuff of leadership. Toxic Workplace! gives you the research-based tools to identify and deal with the 'dark side' of this important dynamic. Read it and you will engage your organization in new, more authentic, and effective ways!" Mitchell Kusy, PhD, is a consultant and full professor in the graduate program in Leadership and Change at Antioch University. A 2005 Fulbright Scholar in international organization development, Dr. Kusy consults globally in strategic planning, leadership development, 360-degree feedback, organization development, and designing organizational communities of respectful engagement. He is a visiting professor at several universities internationally. Elizabeth Holloway, PhD, is a consultant and full professor in the graduate program in Leadership and Change at Antioch University. A Diplomate of the American Board of Professional Psychology and Fellow of the American Psychological Association, Dr. Holloway has had more than 25 years' experience as a practitioner, educator, and consultant with organizations, groups, and mental health clients. She consults globally on system approaches to mentoring, coaching, and creating organizational communities of respectful engagement. Part One: Understanding Toxic People and Toxic Environments. 1. The Human and Financial Costs of Working with Toxic People: Toxic Behaviors Are Just the Tip of the Iceberg. 2. Recognizing the Toxic Personality: It Isn’t as Easy as You Think. 3. Leader Reactions and Strategies That Typically Don’tWork: Why Identify Strategies That Don’t Work? 4. Organizational Culture: How Toxicity Spreads Like an Infection. Part Two: The Toxic Organization Change System Model. 5. Organizational Strategies: Dealing with Toxicity at the Highest System Level. 6. Team Strategies: Dealing with Toxicity at the Team Level. 7. Individual Strategies: Dealing with Toxic People One-on-One. 8. Myths and Truths About Toxicity—and Renewal from a Toxic Environment: How to Move Beyond Toxicity. Appendix A: Our Research Methodology. Appendix B: National Survey Responses on Toxic Behaviors.